In hibernate; it is important for developers to understand whether an object is saved in the database or not. In this tutorial, we will explore the different lifecycle states of an object in the Hibernate framework. Hibernate is an object-relational mapping based java technology that saves, updates, delete a record in the database table. 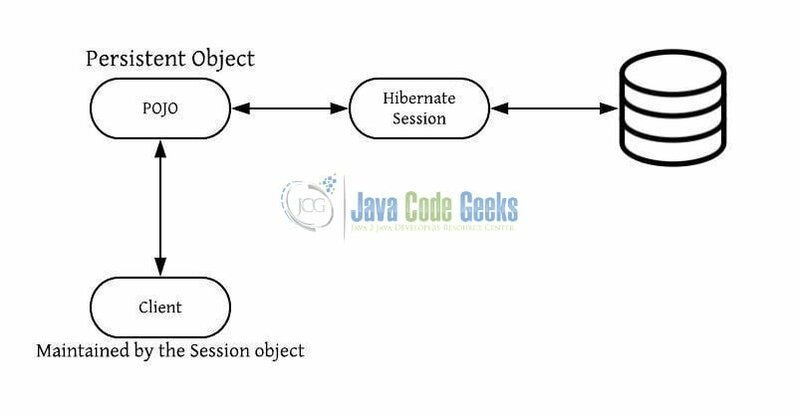 The object lifecycle in hibernate shows how the pojo objects are managed. Let us understand these states in detail with an example. A transient state is one where hibernate session is not associated with the object instance and does not represent a row in the database table. The pojo object is created using the new keyword and does not contain any primary key identifier. The following snippet represents a simple syntax to understand this state. // Employee object is a 'transient' state. A persistent state is one where hibernate session is associated with the object instance and does represent a row in the database table with a valid primary key identifier. Developers will have to use the methods like session.save(obj), session.update(obj), session.persist(obj) or session.saveOrUpdate(obj) to preserve the transient object to the database. The following snippet represents a simple syntax to understand this state. // Persistent state. Hibernate will the employee object to the database. // Modification is automatically saved because the employee object is in persistent state. Always remember, the object in the persistent state will only be saved to the database when the transaction is committed. In this state, the persistent object still exists after the closure of the active session. In other words, the changes to the pojo object will not be reflected in the database and vice-versa. 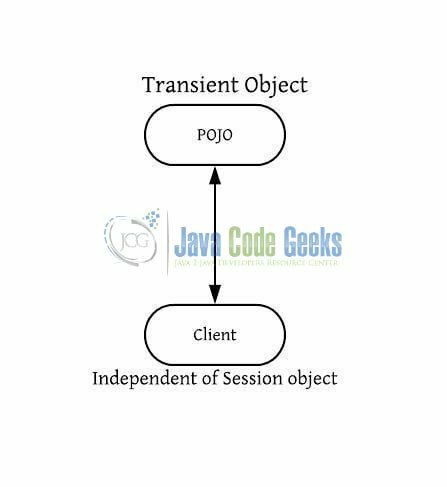 Different methods like session.evict(obj), session.close() and session.clear() can be used to detach the persistent object. The following snippet represents a simple syntax to understand this state. // All the objects will be in the detached state after the execution of this line. When the persistent object is deleted from the database, it is passed to the session’s delete(obj) method. At this state, java instance exists but any changes made to the object are not saved to the database. Developers can use the session.delete(obj) method to remove the database record and will no longer manage the pojo object. The following snippet represents a simple syntax to understand this state. // Removes a persistent instance from the datastore. Take a look at the below diagram to briefly understand these states. Take a look at the below example to briefly understand these states. // 'emp' object is in 'TRANSIENT' state. // Session object to start the db transaction. // Transaction object to begin the db transaction. // Here 'emp' object is in 'PERSISTENT' state. // 'emp' object will be saved to the database. // Closing the session object. 'emp' object is in 'DETACHED' object. 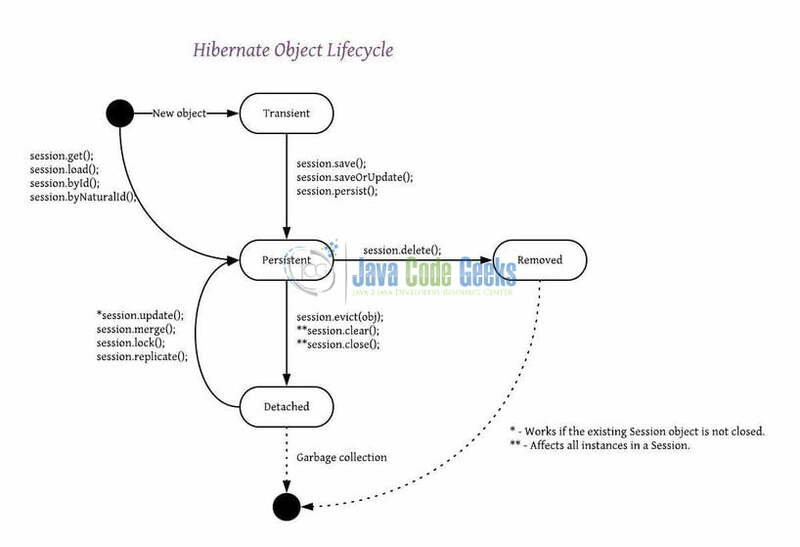 This post defines the different lifecycle state of a pojo object in the Hibernate framework. Developers can download the sample code as an Eclipse project in the Downloads section. This was a beginners tutorial to illustrate the different lifecycle states of a pojo object in the Hibernate framework.